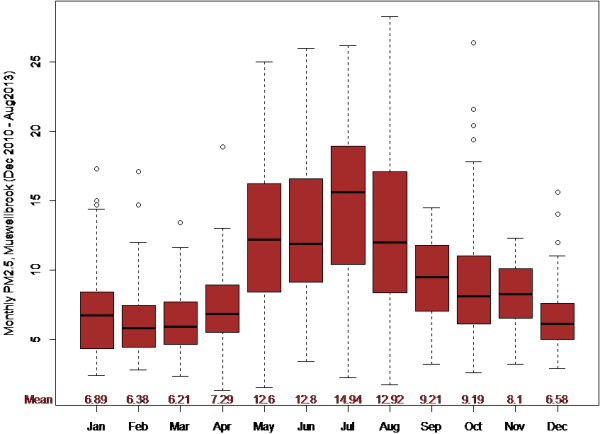 The seasonal pattern of measurements of at Muswellbrook, from the start of monitoring in December 2010 tend to confirm this result, with peaks in winter most likely due to wood heaters, but a somewhat elevated background level from mining and possibly some hazard-reduction burns in spring. Comparison: Armidale vs Muswellbrook. Although Muswellbrook's pollution seems quite high, rural towns where a higher proportion of households use wood heating have even higher pollutions, as shown by the comparison of PM2.5 levels in Muswellbrook and Armidale, NSW. On still, windless days wood smoke is not blown away (photos, right), resulting in double the PM2.5 pollution of coal towns such as Muswellbrook. 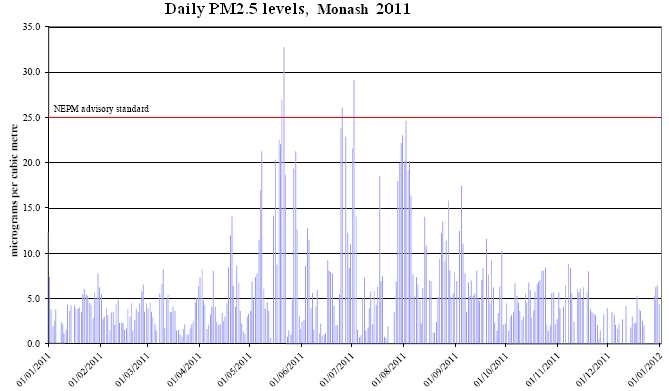 Monthly mean and range of PM2.5 measurements at Muswellbrook, December 2010 to August 2013. ABC Catalyst episode on coal dust. 1) Australia’s 1.1 million domestic wood heaters emit about 40,000 tonnes of PM2.5 per year, compared to 12,000 tonnes from electricity generation and 7,700 tonnes from coal mining (2011/12 NPI data). 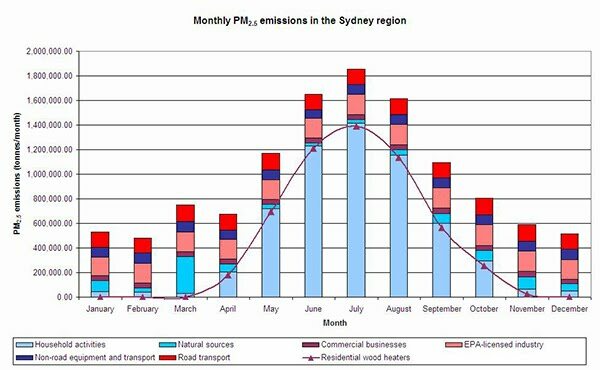 PM2.5 from wood heaters affect health in many cities including Sydney (where more than half of man-made PM2.5 emissions come from a small proportion of households using wood heaters), mining towns such as Muswellbrook (average PM2.5 14.9 ug/m3 in July, compared to 6.6 for Dec-Feb) and smaller regional towns such as Armidale, which had 29, 37, 26 and 23 exceedences of the PM2.5 standard in 2009, 2010, 2011 and 2012 respectively. The current woodheater test does not reflect real-life emissions. A new heater rated 4 grams/kg firewood is expected to emit 10 g/kg in real life. One rated 1 g/kg is expected to emit 6.4 grams PM2.5 per kilogram or firewood, i.e. 19 kilograms of PM2.5 if burning 3 tonnes firewood per year. Until a new test for wood heaters has been developed, would Panel members support the three most cost-effective options in the NSW Economic Analysis – phasing out existing wood heaters when houses are sold (health benefit $4.015 billion in NSW, cost $36 million), not allowing new heaters to be installed (health benefit $2.206 billion, cost $134 million) and annual licencing fees (health benefit $1.267 billion, revenue $11 million)? 2) If a new test reflecting emissions can be developed, how many kilograms of PM2.5 per heater per year (or its equivalent in grams per kg of firewood) would the Panel consider appropriate for Australia's 1.1 million wood heaters? 3) The recent Senate Inquiry report advised that "In Sydney, improving wood heater pollution standards to 1g/kg would represent 1% of the cost of meeting the air quality targets of the NEPM, while representing 66%of the necessary abatement in PM10 levels." p58). This is despite the fact that a new heater rated 1 g/kg on the current test is likely to emit 6.4 kg of PM2.5 (with estimated health costs of more than $1,500) for every tonne of firewood burned. Given the availability of affordable alternatives, and such large health costs, would it be even better to not allow new woodheaters until a satisfactory health-based standard for emissions has been developed? 4) In 10 hours, current new domestic wood heaters have average real-life emissions of 100 g of PM2.5 – as much as the average passenger car or new diesel SUV or 4WD emits in a year. During temperature inversions, pollution can be trapped close to the ground. With 1 wood heater every 2,000 m2 emitting 100,000 ug in 5 hours, PM2.5 trapped in a 10 metre inversion layer would build up to 5,000 ug/m3 in 10 hours if the pollution is not blown away. Is this acceptable or would the Panel support the recommendations of the Australian Lung Foundation and the American Lung Association not to use current wood models when there are affordable, cleaner alternatives? 5) With the average new wood heater burning 3 tonnes of wood and emitting 30 kg of PM2.5 per year at roof height, how far away is it desirable to live to avoid any increased risk of health problems? 6) How many coal trains would have to pass on a rail line 800 metres away to expose someone to emit the same amount of PM2.5 as living next to and downwind of a typical new wood heater burning 3 tonnes per year and emitting 10 g PM2.5 per kg firewood? CANBERRA. ABS data on main source of energy for heating 2011 (click to enlarge) - wood heaters used as the main form of heating by 2.3% of ACT residents, yet there is a substantial increase in PM2.5 pollution in winter, consistent with a substantial increase in pollution when residents start to use wood heating. The NSW EPA graph of health-hazardous PM2.5 emissions in the Sydney region makes it is only too clear, everyone who cares about their health should demand immediate action to implement the 3 effective woodsmoke-control measures and save $6 billion in health costs.